There is no shortage of fun, thrills and sport discovery. This unique camp experience will rock their worlds, and you’ll end up with an inspired, happy, healthy and super active kid. This is where DREAMS start, let us plant the seed, and then you can watch them grow! Your little one will test-drive and explore all types of sports and activities as a Mini Sport Launcher! This half-day camp includes 30 minutes of swimming lessons a day and fitness fun sessions. The week includes all COREsport and SPORTainment elements. Th is camp provides your child the opportunity to develop basic movement skills such as learning how to throw a ball and foundations for swimming. Participants will enjoy meeting new friends while making memories that they will talk about all year. All children must be toilet trained. Unleash your inner Ninja in this full week day camp geared towards kids who are looking for action, thrills and challenging obstacles. 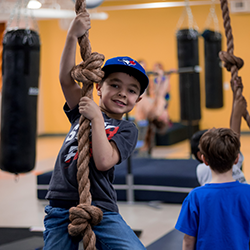 Campers will explore and grow basic skills for activities and sports using fundamental movement patterns that build agility, balance and coordination in our COREsport sessions. SPORTainment features, such as our Ninja Chamber, will push the limits of action and excitement. An afternoon exploring aquatic activities will be sure to get your child engaged and excited! Sign your Ninja up today! Certified instructors from Chinook Rhythmique Gymnastic Club will teach athletes basic skills in the Olympic Sport of Rhythmic Gymnastics: an exciting blend of ballet, jazz, and gymnastics! Athletes are introduced to music and movement; they will learn balance and coordination using hoops, balls, ribbons and ropes. Participants do not require any previous experience and will be organized in age appropriate & skill based groups. Swimming occurs daily. Synchronized swimming is a unique sport that combines a variety of athletic disciplines including swimming, dance, and gymnastics, in the water! 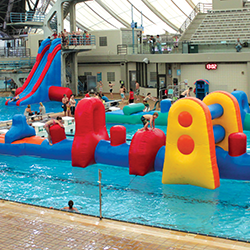 Depending on the week, coaches from the Calgary Aquabelles Synchro Club or Elite Synchro club will teach swimmers basic sculling skills and synchro positions. Synchro camp promotes fitness, team spirit, dedication, and goal setting, it also cultivates friendships that can last a lifetime Participants must be able to swim 25 metres unassisted and be comfortable in deep water. 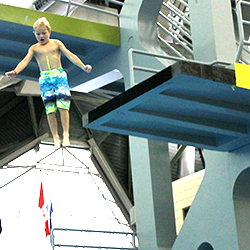 Repsol Sport Centre has collaborated with Rocky Mountain Diving Club to teach athletes springboard and platform diving in a safe, fun and challenging environment. All instructors are certified. Participants must be able to swim 25 metres unassisted and be comfortable in deep water. On Guard! A fascinating introduction to Olympic fencing - no experience necessary and all equipment is provided! Certified instructors from Priori Épée Fencing Club will teach participants about the fun sport of fencing and while learning good sportsmanship and self-discipline. Fencing Camp is organized into age specific weeks (8-11 years old and 12-14 years old). Great for kids looking to try something new! Swimming occurs daily. Participants will love the challenging sport of Water Polo in this learn-to-play, grass roots camp using Water Polo Canada’s I Love Water Polo Program. Certified coaches from the Calgary Torpedoes Water Polo Club will teach athletes basic skills including stroke development, body positioning, ball handling, eggbeater, sculling, trudgeon, spidering, and tactical skills. This camp is ideal for youth wanting to join a water polo club or league as it is non-contact and uses adapted rules. Participants must be able to swim 25 metres unassisted and be comfortable in deep water. Repsol Sport Centre and Ares Pentathlon and Fencing Club have partnered to introduce your child to the exciting sport of Olympic pentathlon. Participants will learn about the five sports that make up the modern pentathlon: fencing, swimming, show jumping, laser shooting and running. Campers will participate in four of the five sports involved (show jumping will not be taught). Participants must be able to swim 25 metres unassisted and be comfortable in deep water. Repsol Sport Centre has partnered with Killarney Swim Club to introduce your child to the sport of competitive swimming. Instructors will teach basics in the water or help those who are more advanced to perfect their swim strokes; this camp is open to all levels. This is a great camp for those swimmers who wish to improve their skills with the goal of transitioning to competition. Your child will learn about the pace clock and pool etiquette. 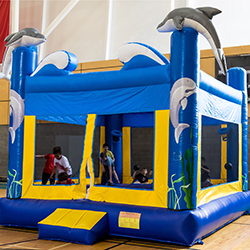 Killarney Swim Club has been delivering programs for the past 25 years that promote skill improvement and positive character development in an environment focused on fun, friendship, and support. NEW! Did you know we have PD Sport Camps? Find out more! 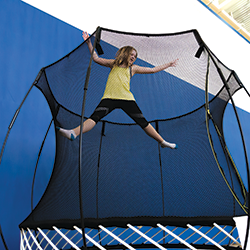 There is no shortage of fun, thrills and sport discovery for ages 4-14. This unique camp experience will rock their worlds, and you’ll end up with an inspired, happy, healthy and super active kid. This is where DREAMS start, let us plant the seed, and then you can watch them grow! Renowned Swim for Life® program taught by amazing instructors. 30 minutes of swimming lessons is included in daily swimming. Catch big air while you jump and shoot hoops. How high can you go? Compete for baskets, beat your best time, and safely learn different moves! Participants must pass a 25 metre swim test, life jackets are not allowed on dive boards/towers or drop slide.